Most Popular Reward is $25.00 but do not lose track of $100 rewards . Offer something tangible: “Rewards can be a powerful incentive that convert people to fund and support your project,” says Kulik. For now, unless you’re an accredited investor it’s not legal to offer debt or equity in a company so you need to provide some other reward: a product or service in exchange for the money you receive. Have different rewards that are commensurate with the level of support given. While the average contribution on Rockethub is $75, you need to offer a variety of pricing options below and above that. Offer Rewards of Real Value: I know, I know: How do you know anything is of value until your project funds? That's part of the trick, but really, if your project is valuable enough for you to attempt to make, then it logically follows that its parts connote an inherent value of their own. Scripts, props, on-camera appearances… you name it. In any case, as alluded to above, make sure that the value proposition favors you. For dramatic features, it costs nothing to factor in personalized character names, walk-ons or cameos. (Just make sure you stipulate to any interested backers that they are responsible for travel.) For documentaries, you can send those aforementioned postcards from the road, offer work-in-progress screenings, or arrange a Skype or FaceTime group meeting with you and a subject. The makers of the buzzy indie doc Bronycon offered to interview two $5,000 backers in their film, while the makers of the "Victorian ghost story puppet film" The Mill at Calder's End will hand off some of the movie's puppets after production. Director Jennifer Fox offered artwork, jewelry and even a Tibetan chest to backers of her film My Reincarnation. Nail a $25 reward: The $25 pledge is generally regarded as the most popular on Kickstarter, Indiegogo and most other crowdfunding sites. It's a modest, low-risk commitment for a backer who's intrigued enough to eventually want to watch your project but not intrigued enough to bid on a speaking part or some other top-shelf perk. 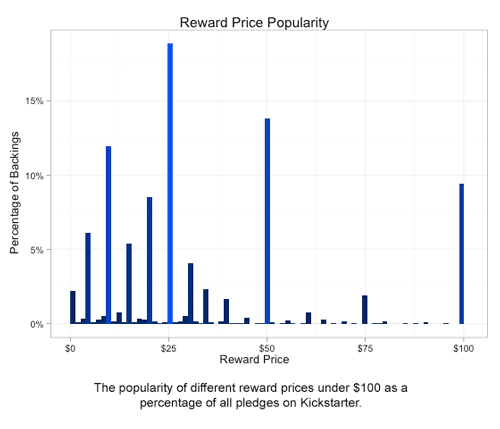 Kickstarter success stories from the microbudget feature Paper Dreams to Charlie Kaufman's Anomalisa to the series Tornado Chasers all offered digital downloads of the completed projects at their $20 or $25 price points -- statistically, anyway, the runaway favorites of the rewards offered. The upside is twofold: The more backers you get here, the likelier your campaign is to sustain its visibility among crowdfunding site admins (who can feature you on their home page) and prospective backers alike. Better still, you can allocate more of your revenue to creation and distribution instead of filling time-consuming orders for expensive swag and other gimmicks. Advanced or early access to the product or service. This may include advance entries for backers to prototype testing programs.